Marion Kahnemann’s thematic focus is human beings, all those people who are so worth noticing and discovering – people with all their potential, boundaries, desires, loneliness and fractures. It is those fractures that are of particular interest to Marion Kahnemann. In the early 1990s the women rabbis in Britain officially heard about a German woman rabbi called Regina Jonas, who was ordained in 1935, when Dr Hermann Simon, Director of the Archiv der Stiftung Neue Synagoge Berlin – Centrum Judaicum (the Archive of New Synagogue Berlin, Central Jewish Foundation) presented the Leo Baeck College in London with her ordination certificate and framed photograph. Fräulein Rabbiner Regina Jonas: a pastor, preacher and teacher in the Berlin Jewish community, and then in the Theresienstadt ghetto, who was murdered in Auschwitz in 1944. To my surprise there was hardly any reference to Regina Jonas in the literature. Only Alexander Guttmann and Michael Meyer make passing reference to Regina Jonas in their discussions of the controversy about women’s ordination at the Hebrew Union College. And then there is the question of the leading Jewish figures who knew Regina Jonas and survived the Shoah – like her teacher at the Hochschule, Leo Baeck, and the psychotherapist and inventor of logotherapy, Viktor Frankl, with whom she worked in Terezín. As far as we know, they did not breathe a word about her. And if Rabbi Leo Baeck did, the knowledge that a woman student at the Hochschule had received s’michah, does not seem to have excited the curiosity of the first post-war generation of European progressive rabbis. Feminists have long been concerned with the question of what (and who) we remember and what we forget. Equally important is the related question of how we remember. In this paper, I consider these questions in relation to Regina Jonas – who in 1935 became the first woman to be ordained as a rabbi in modern times. The critical turning point in the recovery of Jonas’ memory was the fall of the Berlin wall and the opening of the State Archives in the former East Germany. In 1992, the German American professor Katharina von Kellenbach published an article on rabbi Regina Jonas in the German feminist magazine Schlangenbrut. Two years later, a second essay, this one in English, was published in the Leo Baeck Institute Yearbook. In search of a past that would serve as the foundation for a vital future for Jewish women in Germany and Europe, Jewish feminists like Elisa Klapheck and Lara Dämmig, two of the founders of Bet Debora, latched on to the forgotten Regina Jonas. Kellenbach’s archival discovery provided them with the story they needed. The reception and transmission of knowledge about Regina Jonas in America was markedly different. Twenty years before the discovery of the Jonas archive, Sally Priesand was preparing for the rabbinate at the Hebrew Union College (HUC) in Cincinnati, Ohio. Priesand learned about Regina Jonas and mentioned her in her thesis turned book, Judaism and the New Woman. However, she concluded the brief section on Jonas with the sentence “I was actually the second woman rabbi, then, though I was the first to be ordained by a theological seminary.” These two qualifiers about rabbi Priesand’s ordination (“in America” and “by a seminary”) were subsequently used by scholars Pamela Nadell and others writing about Regina Jonas who put her into the category of “would-be rabbis”. When Americans finally decided to memorialize Jonas in 2014, they dedicated a plaque in the concentration camp in which Jonas was interned before being transported to Auschwitz and murdered. With Regina Jonas honored and memorialized at Terezín her story is assimilated into the American story. Europe remains the site of tragedy and trauma, America, the land of new beginnings, of liberty and opportunity, the land where women were first ordained and where their entry into the rabbinate continues to transform Judaism and Jewish life. After she became a rabbi in 1935, Jonas had only a few years to exercise her office. Despite being forced to work in the cardboard factory Epeco in Berlin as of 1935, and her deportation to Terezin in 1942, she kept preaching gender equality as a religiously-bidden duty. She left behind an intellectual legacy that outlasted the horrors of the Shoah, and that is of utmost relevance in the debate around religious and political feminism today by pinpointing the debate to the relationship between religious duties and political rights. It is imperative to resist the tendencies of falsifying the rabbi’s memory by either putting her on a pedestal as “the first” and isolating her historically, or telling the story of her life only ever in direct connection with the Holocaust and risking her murder overshadowing the actual legacy she left behind. To honor Regina Jonas’ contribution means to understand it in her contemporary context of Jewish women’s movements, as well as acknowledging the power it holds in relation to the current Jewish-feminist discourse. As Rabbi Dr. Jackie Tabick approaches retirement after 40 years in the English progressive rabbinate it seemed appropriate to look back at her career. For most of that time it was thought that she was the first progressive woman rabbi but now we know that was not so as Rabbi Regina Jonas was ordained in 1935 but all knowledge of her seemed lost until the 1990’s. Rabbi Tabick’s journey to ordination and her struggle to be accepted is an interesting and fascinating one. She was ordained at a time when women were struggling to find their role in life generally as well as in the professions. This article looks at Rabbi Tabick’s role models, her career path and the impact she has had in the progressive movement. She herself has become a role model showing other women that anything is possible. The article also looks to the future as Rabbi Tabick as she speculates on what may happen to Judaism. Women have always prayed and the bible records many instances of female prayer. Over time women’s prayer has been recorded and collected for other women. Yet the prayer book of the statutory services has remained almost immune to either the voices of women or to prayers that address women’s concerns. Only in the second half of the twentieth century has this begun to alter, and the speed of process and change has been fascinating. We now see siddurim printed where there is inclusive language for the worshipper, the inclusion of matriarchs and other female figures, and gender inclusive and gender balanced metaphors of God. At the same time women have begun to reclaim and adapt old rituals for their use, and new rituals and opportunities for liturgical marking of important life events are being identified and designed. In this essay we look at some of the innovations that have emerged and impacted on the siddurim and machzorim of the more open and responsive streams of Judaism. This is an ongoing and dynamic process and in spite of the speed of change recently (or maybe because of it) the fluidity of the responses to the role of women in liturgy means that there are a variety of ideas co-existing or rubbing against each other. The challenges of modernity addressing tradition are particularly pointed up in this field, and since there are any number of streams of Judaism addressing this issue it is not surprising that there is no real consensus as to how women are reflected and find their place in the prayer books. This makes it an exciting and creative time as each group and individual find themselves outside their comfort zone at different points. Nostalgia and familiarity compete with integrity of language and meaning, and the nature of the Hebrew language adds to the piquancy of the mix. But liturgy has always been a dynamic, unruly and unsystematic construction and the addition of the voices of women to the debate and the production of prayer and ritual is proving to be a great challenge and strength, continuing the two thousand year tradition of continual refreshment and renewal of the process. It was with the the aim to promote women’s participation in the religious sphere that JOFA or “Jewish Orthodox Family Aliiance“ was established 18 years ago. Originally founded in the United States, JOFA now also exists in Great Britain – thanks to the efforts of Dina Brawer, who is currently in training to be a rabbi. JOFA functions as a forum for the discussion of a variety of topics that are of particular interests to the women of the community. Women are encouraged to study the Talmud and Halakhic texts in order to gain a better understanding of the history of Jewish law and tradition, and women’s rights and duties which are often not all that different from those of the men. It is for the benefit of the whole congregation to have women in positions of religious leadership, as their voices enrich the study of the Torah as well as the interpretation of traditions. In Brawer’s case, her wish to become a rabbi was born out of a passion for orthodoxy, the desire to serve her community and to support the people in it. As a rabbi, she hopes to teach, guide and inspire, and evolve Torah and Mitzvoth. She wants to further opportunities for women in a Halakhic context. An appreciation and understanding of the Torah and the Mitzvoth offer a spiritual experience that bring us closer to other Jewish men and women, society, as well as God. Since the 1990s, the movements of Women’s Liberation Lesbian Separatism and Gay Liberation, which centred on the politics of ‘identity’, have given way to a rainbow alliance of LGBTQ (Lesbian, Gay, Bisexual, Transgender Queer) people – more recently extended to include ‘I’ (intersex) and another ‘Q’ (Questioning) – which expresses a profusion of diverse sexualities, orientations, and genders that challenges monolithic thinking and practice. In this paper, drawing on my experience as a lesbian separatist, who went on a journey of exploration into Jewish life, I argue that the challenge of our lives centres, not on who we are, but rather on what we do, together with others, and where we go. The emphasis on ‘doing’, rather than ‘being’ is at the heart of Jewish teaching. Indeed, the very first lesson of the Torah, the narrative in B’reishit/Genesis that relates the creation of the world, emphasises the centrality of ‘doing’. The Torah also makes it clear that to be a human being is to imitate the Divine architect of the world and so be engaged in ‘doing’. Martin Buber drew attention to the parallels between the account of Creation and the account of the building of the Mishkan (Exodus 25-40), the elaborate tent constructed by the ex-slaves in the wilderness. The significance of the building of the Mishkan in the wilderness is underlined by the teaching of the French Jewish philosopher Emmanuel Levinas, who argues that there is no such thing as an essential self. The meaning of the self emerges only in relation with others, for whom we bear a responsibility. The way in which we express that responsibility is by ‘doing’; by actively relating with others. What individuals share when we engage together is not our identity and being, but rather the relationships we create. Like the ex-slaves in the wilderness, by contributing our individual offerings to shared endeavours, individuals generate connectivity and community. Intriguingly, the Jewish emphasis on ‘doing’ is echoed in gender and queer theory, the post-modern incarnations of feminist thought and gay discourse that emerged in the 1990s. Gender and queer theory understand that gender is socially constructed, and that ‘identities’ are not essential and fixed, but rather, who we are, is expressed by what we do. In this paper, I examine how the Jewish emphasis on ‘doing’ facilitates a creative interplay between Jewish life, feminism and LGBTQIQ practice, and argue that the ‘rainbow’ extends to encompass all of us – LGBTQIQ+ – when we let go of the fixed singular notions of identity that constrain us, and participate in building tents of meeting. This is how we – all of us together – generate Rainbow Judaism: Jewish life that embraces diversity and is dynamic and inclusive. Despite substantiated claims for gender equality and political movements of Jewish women, voices of Jewish women play a marginalized role in Jewish contexts in 2015. 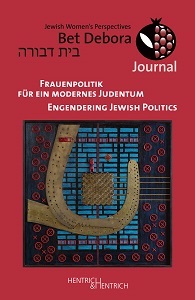 In this paper I reflect on the epistemological basis of Jewish women’s perspectives. My claim is that as a subordinated gender in Jewish contexts women have an epistemically privileged vantage point on society. Subordinated perspectives of women can unveil dysfunctionalities in Jewish societal structures. The recognition of Jewish women as equals would create a more livable environment in Jewish communities. In the procedure of my argument I explicate the theoretical background of my claim, apply it to the situation of Jewish women today, and consider it in relation to arguments for and against gender equality in Jewish settings. A Zen koan (pronounced ko-an) is a short, enigmatic sentence/riddle/paradox used in Zen Buddhist meditation. There have also been Zen-Jewish parodies, and someone came up with the term “Zen Cohen.” I wrote these Zen Cohens as discussion-starters for the Bet Debora 2015 conference. They were informed by the topic, women and power, and by my experience at the 2009 and 2012 conferences. What gender stereotypes are currently prevalent in Jewish educational settings? What impact do these stereotypes have on the way girls and women perceive themselves? What effect does this have on boys’ perception of girls which is mostly shaped by media images? How might those stereotypes be challenged? Can we be reverent or authentic to tradition and also relevant? What would a more inclusive approach look like? How do we relate to and address the female characters in our tradition? Is Miriam Moshe’s sister or is she the prophetess and leader? Are the midwives – Shifra and Puah – the enablers of the Jewish people or as in the Talmud Tractate Sotah – the reason why the Jewish people were redeemed from Egypt? Fairy tales are invaluable when it comes to making a child acquainted with its native culture and developing its sense of national identity. When they contain the spiritual values of a national culture, they allow the child to get to know its own people. The publication of short verses for children is to fulfil this present aim. Fairy tales that rhyme and attractive illustrations in colour are the ideal means of communication with very young children. If they are presented in this way essential elements of Jewish tradition will reach the child directly. They reveal the cultural achievement and display the richness of tradition and as far as this is concerned, will very often appeal to universal values. The children’s reading hour of verse and poetry, the description of a picture can become a way for parents to form the Jewish identity of their child and make the child aware of it. An interesting graphic design, a book which opens from right to left may awaken the child’s curiosity about the Hebrew alphabet. For many families this will be the first contact with an alphabet other than the Latin. Getting to know the history of one’s people through fairy and folk tales will give a child a feeling of being rooted in Jewish culture, a sense of belonging to it and an understanding of what it means to respect its values and achievements. Shulamit Aloni was a great Israeli woman who is in danger of being forgotten because of shifting attitudes in Israeli society. When Shulamit Aloni died in 2014, she asked for a funeral that had both traditional religious and secular components. I interpret this fusion as representing her love of Judaism and secularism while at the same time, her rejection of the religious establishment. Members of the U.S. based Humanistic Judaism Society recognized Aloni’s accomplishments and gave her an award in 1980. Her call for the disbandment of the religious authority with its political power is still relevant. While her championing of individual rights was radical in its time, it is much more acceptable today. For her courage on this matter and many others, she deserves to be remembered. Ever since “Women of the Wall“ was founded 27 years ago, there has been an ongoing and highly political quarrel over who is allowed to pray at the remaining Western Wall of the Holy Temple in Jerusalem, where exactly, what are they allowed to use and how are they allowed to pray and why are they allowed to pray there. Objections are being raised from all sides: the communal and public prayer of women in any shape or form has practically no place in Orthodox Judaism to this day. Consequently, it is ever so much more problematic that the Kotel was turned into something of an ultra-orthodox synagogue after the liberation of the Old City in 1967, where the gendered segregation of men and women is strictly enforced. The women’s section, which is merely a quarter of the size of the men’s section, is dedicated exclusively to private and personal prayer, while the area behind the Mechitzah is furnished for communal prayer. When around a hundred women organized to meet for a communal prayer meeting at the Kotel on December 1st 1988, it triggered an astonishing amount of resistance and opposition. It was Rosh Chodesh, the day of the new moon of the month Kislev, and the attempt to hold a service of worship for women at the Kotel was met with extreme physical and verbal violence from ultra-orthodox men and women. The police did not get involved, as a communal women’s prayer did not constitute a matter of “public interest“. The women, who decided to meet at the Kotel for Rosh Chodesh regularly from then on, resolved that they would not stand for this, and so the initiative “Women of the Wall“ (נשות הכותל in Hebrew) was founded. Following the first act of oppression when their prayer meeting encountered extreme violence, the women brought a claim before the Supreme Court in which they demanded unrestricted access to the Kotel, and that they would be ensured protection from physical and verbal assault while exercising their right to freely practice their religion. The judgment of Jerusalem’s District Court from April 2013 made a big, albeit temporary impact, stating that women who were wearing a Tallit when coming to the Kotel were not in fact violating custom or posing a public nuisance. With this decision, the conduct of the police underwent a total transformation: whereas women had earlier been viewed as a troublemaking presence, the officers would now stand between them and the ranting ultra-orthodox Jews to protect them against attacks. Israeli society shares the concerns about giving religious spaces and symbols over to the ultra-orthodox Chief Rabbinate and thus driving women out from the public sphere. The Kotel is not only a site for worship but also for official ceremonies (including swearing-in soldiers, memorial services for Yom HaShoah, Independence Day and Yom Yerushalayim), where there is a collision between ultra-orthodox concepts of gender and a modern understanding of the State in accordance with democratic values and equal rights and opportunities. In an attempt to resolve the situation, the following compromise was passed by the government on January 31st 2016: A new space for prayer was established with equal access for all genders to the South of the Kotel, and is now being managed by a committee including the government, Jewish Agency, representatives of the Conservative as well as the Reform movement and the “Women of the Wall”. This set-up highlights that the demand for religious pluralism has finally arrived in Israeli society and politics. It is a modern-day Chanukkah miracle that this initiative, which has been uniting women from a range of religious traditions for 27 years, has brought about social change with its services of worship. Since 1989 Project Kesher has worked bringing women together, creating a network of Jewish women, helping women who knew nothing or very little about what it means to be Jewish, not only to become Jewish, but to create and strengthen Jewish community life in Russia, Ukraine, Belarus, Georgia and Moldova. We shared success and analyzed the changes. We felt that we were one people. Due to the present political crises we lost our vision as one Jewish people, we became divided. It was clear Project Kesher needed to take action. We started with International Skype calls. Every evening one woman from Russia, one from Ukraine, one from Belarus, one from Israel called a woman in another country: talking, sharing our love and support, wishing peace. When women started calling each other again and restoring broken relationships we saw that “KESHER” – connection – is working. One day when there was a serious military clash in the area where she lived one of our leaders proposed to read Tehilim (Psalms), as prayers for peace. Soon more than one hundred women were reading Psalms, creating a chain of peace. Such a spirit of peace prevailed even at a time when the air was filled with war. In Russia there are refugee families from different regions of the Ukraine. Sometimes they lost everything. Project Kesher women’s groups in cooperation with other Jewish organizations collected clothes, foot-wear as well as school-bags, school record books, sketchbooks, colored paper, paperboard, plasticine, pencil boxes, paints and markers for refugee children. Project Kesher activists also actively participated in organizing camps for refugees in Kharkiv and the Dnipropretrovsk region (Ukraine). In times of conflict the wish to live in peace is not enough. Women needed instruments for conflict resolution. Project Kesher developed a unique leadership training program with the aim to enable the participants to conduct trainings in conflict resolution themselves in Jewish communities and partner organizations and to engage in mediation. These trainings are often based on Jewish tradition and text study. A special event is Project Kesher’s Global Women’s Seder that was celebrated in 2015 for the 21st time. No less than 2500 members of 140 Project Kesher women’s and youth groups in 110 cities and five countries – Belarus, Georgia, Israel, Russia and the Ukraine – participated this year. The participants spoke about peace and declared that they intended to do everything possible to maintain peace in their families and in society. With the energy it sets free Project Kesher continues to initiate positive changes. Philosopher Margarete Susman (Hamburg 1872 – Zurich 1966) should be named in the same breath as her friends Georg Simmel, Martin Buber, Ernst Bloch, Gustav Landauer, Franz Rosenzweig and Paul Celan. As one of the Jewish Renaissance and secular messianism’s true pioneer minds, she helped steer the wider conversation about Judaism in Germany. Her work on the spiritual meaning and importance of Judaism in and for Europe, on the revolution, the emancipation of women, the relationship between religion and the state, as well as that between Judaism and Christianity contains important and thought-provoking impulses for discussions of these topics today. A key concept in Susman’s work is “God’s law“. Susman first introduced the idea in her essay “Spinoza und das jüdische Weltgefühl“ from 1913, which forms the starting point for a religious and simultaneously secular understanding of Judaism. Within this framework, Susman explicates Spinoza’s philosophical mode of cognition as fixated on laws or “legal thought“, whose origins can be traced back to perceiving Jewish religion as “God’s law revealed“. Many of her essays were published in the Frankfurter Zeitung, the liberal Jewish magazine Der Morgen, and Buber’s Der Jude. In them, Susman writes on “God’s law“, less as a repressive instrument employed to force obedience, and instead as an increasingly political means to liberate oneself from oppression; she introduces the notion of religiosity as the key to resolution and salvation by way of a better, messianic future. As a supporter of the November Revolution, Susman articulated her conviction that the Jewish people shared a revolutionary and thus religious responsibility for societal reshaping of languished Germany in her 1919-pamphlet Die Revolution und die Juden. To Susman, revolution meant the actualization of the Jewish-religious concept of atonement or “Teshuva“, meaning an atonement that is not synonymous with punishment as in the Christian understanding of the term; instead it is derived from the Jewish interpretation that posits it as a positive that holds the potential for revolutionary “reversal“, realized through cleansing, expiating change and a re-thinking and -structuring of the political present. By the end of 1933, Susman had left Germany and migrated to Switzerland, never to set foot on German soil again for the rest of her life. In her new home Zurich, she committed herself to Protestant minister Leonhard Ragaz’s religious socialism and began writing extensive religious-philosophical articles for his publication Neue Wege. It was during World War II that Susman wrote Das Buch Hiob und das Schicksal des jüdischen Volkes, which was published in 1946 and is a first attempt at making sense of the Shoah through religion. Many believe it to be her most important work. Susman’s life’s work is comprised of 17 books and circa 250 essays and articles, in which she expresses a wide range of intellectual lines of enquiry that offer alternative ways of receiving her observations and arguments. Her Jewish writings, however, remain especially bold to this day: in them, she expresses a vision of humanity that cannot do without Judaism. The European Parliament is deeply concerned about the increase in anti-Gypsy attitudes, and therefore calls for more efforts to end discrimination, hate crimes and hate speech against the Roma people – says the European Parliament’s resolution of April 15th, 2015, which recognizes August 2nd as the Day of the Roma Holocaust Remembrance WHAT DOES IT SAY?. Four years earlier, in July 2011, the Polish Parliament established August 2nd as the Day of the Roma and Sinti Holocaust Remembrance REPETITION. These very important initiatives show that the Roma genocide is no longer a forgotten page of history and has been recognized by important national and international institutions. However, this doesn’t mean that everything in the area related to the commemorating of the extermination of the Roma and Sinti has been done. This is a long process which began decades ago and was initiated by the Roma community. It was not an easy road and many activities are still ahead of us. Especially since despite the efforts and numerous initiatives by the Roma communities and support by national and international institutions, in many countries it is believed that the Roma themselves should be solely responsible for commemorating the genocide of their own community and the dissemination of knowledge about their history including the tragic period of the Second World War. Is this really the way it should be? Should it not be the responsibility of all of us as Europeans and humans? The history of the Roma is an integral part of European history. In addition, there are institutions that were established in order to nurture and promote memory and knowledge about the Holocaust – should they not take a more general approach and include the story of the Romani nation in this effort for remembrance? For years, the memory of the extermination of the Roma and Sinti was more or less non-existent. While the newly established German Federal Republic quickly acknowledged the Jewish victims, it kept silent for decades about the genocide committed against Roma and Sinti and did not grant compensation rights to people who had survived the nightmare of the war. Currently, the commemoration of the crimes committed against the Roma and Sinti is an extremely important issue for the Roma and Sinti community and especially for their leadership. Not only for humanistic reasons, not only because of the inner, individual need to cultivate the memory of past crimes, but also due to the ethno-genetic nature of this form of collective Roma and Sinti memory. The memory of the Nazi crimes is a unifying element for a community dispersed among many countries, diverse in terms of dialect and culture, and thus an important factor contributing to the emergence of a shared Roma and Sinti national identity. Between May 14th and July 9th 1944, a special Security Police commando unit (“SEK“), led by Adolf Eichmann and vigorously supported by the Hungarian gendarmerie, deported 437000 Jewish men and women from Hungary. While the vast majority were taken to Auschwitz, 15,000 deportees were re-routed to Strasshof an der Nordbahn to be forced to work in commercial and industrial plants as well as in agriculture and forestry in Vienna and Lower Austria. The group suffered a scarcity of men of military age since roughly 80,000 Jewish men had previously been conscripted into labour service in the Hungarian army and were thus excluded from the deportations. This left the women with the responsibility of supporting not only their children, but often also their parents and parents-in-law that had been deported to Austria with them. To increase the number of workers, the companies began using children from the age of ten for hard labour in exchange for the same food rations as their adult counterparts. This was a large factor in a time characterized by constant food shortages and hunger. The elderly were confronted with a choice between starving or else performing work tasks too demanding for them in order to receive the full food rations. A change in family roles was brought on because mothers could only partly support their children, and were themselves at the mercy of guards and their superiors: mothers and their children became each other’s partners in their fight for survival. In this struggle, they were dependent on the help of non-Jews. The fate of the children especially inspired compassion in Austrian women who would secretly slip them some food or food stamps on their way to work. Mothers who were given food by their colleagues in the workplace would also keep it back for their starving children. While the main support that the forced labourers experienced in Vienna came from the local population, in Lower Austria it was often prisoners of war who made friends with the women and shared foodstuffs that they received from home with them. Towards the end of the war, the Hungarian-Jewish men and women were supposed to be transferred to Terezín. After the train station in Strasshof had been destroyed however, they were ordered to march in the direction of Mauthausen. Throughout the final weeks of the war, hundreds of Jewish men and women fell victim to the Waffen-SS who violently purged the frontline areas of Jews. From April 23rd 1941 to May 16th 1942, the girls of the Kvuzat Cherut (Freedom Group), a sub-body of the Zionist youth organization Hashomer Hatzair (Young Guards), kept a diary. The writings offer an insight into their fates during a time when Jewish adolescents and adults were forced into work outside Vienna, and large-scale deportations to ghettos and concentration camps “in the East“ were underway. The girls describe their everyday lives, their hopes and dreams but also their mourning over the loss of friends that were taken from them. The diary, which was salvaged by members of the Zionist youth movement who survived the Nazi era in Vienna, is split into two parts: there is a section that tells of the life and forced labor in Vienna and the “Old Reich“ in general, and a second part that is sort of a „camp journal“, detailing the forced labor in Siems near Mieste in the Magdeburg-region. The journal entries were written by alternating members of the group of young women, and so the diary speaks in different voices about the girls’ lives and their reactions to persecution happening in Vienna, as well as their experiences as forced laborers. On May 16th and 17th, around fifty young women were sent away to the “Old Reich“ as forced laborers. In the diary, they recount the preparations and document the collaborative efforts of the Central Office for Jewish Emigration and the employment agency in exploiting the workers. The first entry in the camp journal dates back to May 18th 1941, penned in Siems near Mieste. The girls chronicle their daily routine in the camp: getting up, work, the quality of the food (stew for lunch, unsweetened coffee), bedtime from 9 PM and the significance of the correspondence with Vienna. After three days, the first girl broke out in a rash, which the others assumed to be scarlet fever or the measles; they still went to work the next day. They tried to keep up the youth movement’s rituals and traditions despite the exhausting work days and sickness that was spreading to more of the girls. On June 14th 1941, the girls were allowed to travel back to Vienna as a large number of them had fallen ill. Back home, however, they were forced to report to work just the same. In autumn 1941, they realized that every single one of them would be taken to Łódź or another Polish ghetto sooner or later. The last entry from May 16th 1942 concludes that there was nothing left “worth writing about“ after so many of their friends had been deported. Most of the Kvuzat Cherut’s Chaveroth were deported and murdered. Greek artist Artemis Alcalay explores, in portraits of Holocaust survivors, the impact of the occupation and deportations on the lives and values of Greek Jewish citizens. Although these portraits reflect the moral complexities of life and death under foreign rule in the context of an unfolding political tragedy, her art accentuates the brutality of deportation and the disruption of an entire society’s integrity. Nazi policies of violence, terror and extermination can be read between the lines of a narrative without words. The world of Hitler’s New Order and slave labour are set in an emotional personal context rather than producing a complete picture of its brutal reality. Artemis Alcalay reminds us that in the first post-war decades most survivors chose silence. “After the 1980s and especially the 1990s the Holocaust began to enter public discourse”, she says. “Only in the last 20 to 25 years have we in Greece started to speak publically about Greek Judaism, through the first written testimonies, conference discourse, and original research work. Today, these fragile figures are a connection not only with the past but with something beyond time and history. They are a huge family portrait in which we are all reflected”. Journalist Nikos Vatopoulos of Kathimerini newspaper (Athens) comments: “As [Alcalay’s] photographs add up . . . like urban aquariums of memory and a motionless daily routine, there doesn’t appear to be any intention to record. Moreover, these portraits emerge like stems of a large bouquet, tied in a ribbon that passes from one generation to the next”. Prisoners at the former Stasi interrogation prison Hohenschönhausen, in East Berlin, were political – psychological interrogation methods had been designed to break down the personality so that these writers, artists and musicians, would forthwith desist from political activism. On arrival at the prison, whether male or female, all detainees had to strip naked, and undergo a body search; they were regularly taken into corridors to stand naked with their arms leaning against the walls for long periods of time. In May 2013, I attended a photography workshop with the opportunity to document on the premises. The resulting photo series remembers abuse that took place in Hohenschönhausen some 25 years ago, but reminds also of institutionalised torture and humiliation that is still common practice in many parts of the world today – the images remind of the scandalous photos taken by prison guards of the US detention camp in Abu Ghraib, Iraq 2004. With Artistic Freedom, as prison guard or interrogator I wear the military look, fashion camouflage – as the prisoner victim I am naked. My motivation with the photo series was to better understand the behavioural constructs furthered by this and other tyrannical regimes, by embodying them.